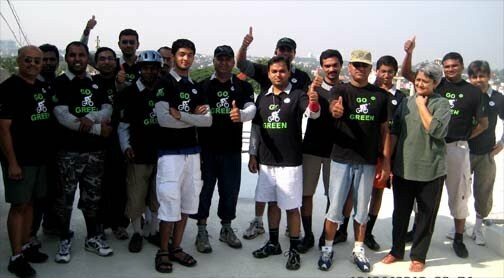 GoGreen Campaign Ride towards Langford/Richmond town 18 April 2010 - GGI-Group size: 4000+ Professionals, Increasing on day to day basis, Come & join us 2 serve Mother Nature. 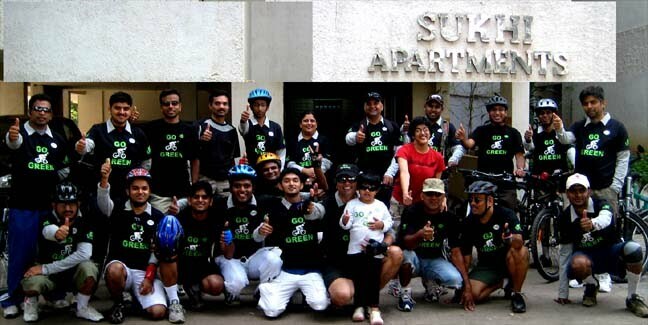 This week's ride was towards Langford/Richmond town where Mr. Vasanth Kumar & Padmini live. Totally 24 GGI Participated in today's ride. Started from Reliance I-Store @ 6:55am reached Cubbon Park by 7:30am where we met other members who were already waiting for us. Went and assembled @ Central library & took group photo graphs. This time we had 6 new members into the group which includes a Rashi (old member who joined us after 1 year). City Library - Malya Hospital, hotel Ramanashree - Residencey Rd flyover - Shanthi nagar road - Foodball stadium - Sukhi Apartments - doubel road -Lalbagh Main gate - Lalbagh rear Gate - Ashoka Pillar - Swiming Pool road - Jaynagar 4th block - KFC - Jaynagar 5th Blk Cofee day/ Apple Mac show room.